So, I know that this Book Spotlight is late. Why? I absolutely forgot about it. I apologize you guys. I don’t even know how it happened honestly, but I will be better about my posts from now on. I normally don’t do this which is why I am in a state of shock. Anyways, let’s continue with what you really want to read. I really really enjoyed Catching Jordan. Having a girl be the captain of the football team and play better than any of the other guys on the team was freaking awesome. It is a book about the unconventional. We have sports, romance, family, and friendship. Pretty much it has it all. Just thinking about this book makes me want to read it again. Yup, it’s that awesome. What girl doesn’t want to be surrounded by gorgeous jocks day in and day out? 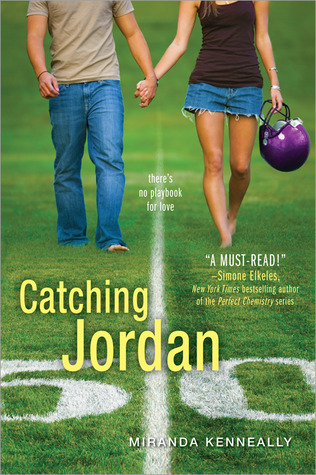 Jordan Woods isn’t just surrounded by hot guys, though-she leads them as the captain and quarterback of her high school football team. They all see her as one of the guys and that’s just fine. As long as she gets her athletic scholarship to a powerhouse university. But everything she’s ever worked for is threatened when Ty Green moves to her school. Not only is he an amazing QB, but he’s also amazingly hot. And for the first time, Jordan’s feeling vulnerable. Can she keep her head in the game while her heart’s on the line? I was a bit skeptical about this book because I thought to myself I can not in any way relate to Jordan, I’m not a football player but after reading the first chapter at Barnes & Nobles, I went against my previous stance and bought the book. This book was perfect. Some people say it was cliche but I have a different opinion. To me it was the opposite of cliche. The love triangle was very different in the sense of I didn’t expect it to turn out like it did. I loved this book and the fact that Jordan stood up for herself and when she saw that something was wrong for her, she changed her behavior and did what was best for her. In YA we see a lot of female characters be at the mercy of the guy and I loved that Jordan was not that girl.